Experience the sweetest sour event of the year! 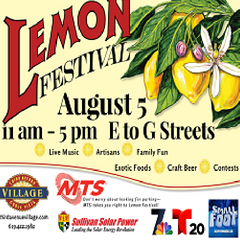 Head over to South Bay on August 5, 2018 for Chula Vista Lemon Festival. Fill your day with live entertainment, a kid’s fun zone, lemons galore and so much more! Don’t forget to wear your brightest yellow outfit! See you there! Reach new heights with the Festival Fun Zone located at F Street where bungee rides, a rock wall and more will delight thrill seekers of all ages. Brimming with interactive features and giveaways from community partners, this 22-year tradition is more refreshing than the fresh-squeezed lemonade offered in abundance. Visit sandiego.org for more details.